From the very first frame of Winchester, it’s abundantly clear what the Spierig Brothers – Michael and Peter – are trying to pay homage to. When you see the title in neon red, surrounded by a patterned border with small credits underneath it laying out the copyright jargon, you absolutely get that their motive is to make a scary gothic ghost story in the style of the old Hammer Horror line of movies, similar to what Tim Burton’s Sleepy Hollow tried to do previously. From then on, a lot of it has that old-style feel to it, in the way that the cinematography slowly zooms in on things to how certain characters are designed, and so on. The problem is, they’ve not made a particularly good Hammer Horror film; were Winchester made back around the time when it was a more popular line of films, this would have easily fallen right in with the ones that would just be forgotten, and if remembered at all it would be for how redundant and lame they were. Based on real events – though I’m quite positive that nothing of what happens in this film actually happened in reality – we learn that Sarah Winchester (Helen Mirren), the widowed heir to the Winchester Repeating Arms Company and its vast fortune, is overseeing endless construction on a large mansion which she claims is to keep several ghostly spirits, who have been at the mercy of her company’s rifles, at bay. A psychologist, Dr. Eric Price (Jason Clarke), is summoned to do a psychological examination of Mrs. Winchester, but soon he, Mrs. Winchester, her niece Marian (Sarah Snook) and Marian’s young son Henry (Finn Scicluna-O’Prey) become ensnared in a deadly trap by one of the ghosts who has a pretty serious grudge against the Winchester widow, and from there everything you’d expect from a typical ghost movie happens – possessions, visions of the past, strange noises, and so, so many jump-scares. The thing is, a film about the Winchester mansion – a real location in San Jose, California that’s said to be one of the most haunted buildings in the world – is not a bad idea, and if done right could lend itself to some seriously scary and provocative imagery. Unfortunately, Winchester – subtitled The House That Ghosts Built in the promotional material for no real reason; it’s not even the right line said in the movie at one point, “the house that spirits built” – is filled with too many redundant horror movie clichés to work as well as it should, and the story and characters are far too standard to even care about any of it. The Spierig Brothers have made some effective movies with horror themes in the past like Daybreakers and Predestination, not to mention last year’s franchise reviver Jigsaw, and though their hearts may have been more in this film than Jigsaw probably was, because again you can see what they’re going for here, it falls so underwhelmingly flat because there’s just nothing fresh about it at all. All the scares you can see coming from a mile off, partly because some of them were plastered all over the trailers, but also because they are telegraphed so early on that you’re just waiting for the other shoe to drop instead of being invested in anything else that’s going on. The Winchester house in this movie is apparently filled entirely with jump-scare ghosts, because around every single corner there seems to be a demon with a creepy face coming up to the camera accompanied by a loud musical sting, and it gets old extremely fast, not to mention you’ve seen these type of scares done much better and more maturely in other horror movies as well. It really isn’t scary primarily because every single attempt to make you jump in your seat is so predictable, and the atmosphere isn’t spooky or even creepy enough to warrant any of them; the house, in this movie, looks just like every other Victorian mansion ever put in a horror movie, and there’s nothing too new about it to feel different or fresh. It’s quite a slog to get through, even though it clocks in at just over an hour and a half, but it somehow feels longer because it’s just so boring to watch. You have to give credit to Helen Mirren, Jason Clarke, Sarah Snook and most of these actors who are doing whatever they can to make this thin material seem more dimensional than it really is, but the inclusion of even an acting legend like Mirren makes it seem all the more wasteful, because these are good performers that should be in a far better movie than this. Additionally, in keeping with the Hammer Horror homage that the Spierigs seem to be going for, a lot of them seem to be delivering their lines in a rather campy manner, with very unsubtle creepy stares to them that just look ridiculous more than actually chilling; god bless Mirren for doing what she can, but the way she’s directed here is often like a vaudeville interpretation of a crazy old lady, and we all know by now that Dame Helen Mirren is way above these kinds of roles in the first place. There’s also one actor in the film, whose character is that of a spoiler (if, this deep into the review, you’re still considering going to see it), who sounds exactly like what it actually is: an Australian actor adopting a painfully fake Southern accent, which is not just distracting but renders the scene he’s in unintentionally funny. It’s a pretty weak early-year horror movie, and disappointingly so considering it has actual talent involved both in front of and behind the camera; but unlike something like The Bye Bye Man, at least this one has intentions and things it wanted to lovingly pay homage to – it just so happens that it did those things rather poorly. 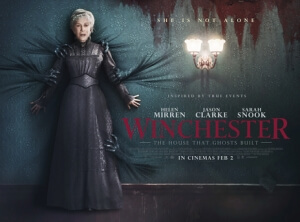 Winchester is another run-of-the-mill horror movie with almost no originality or effective scares to it, which not even the addition of strong actors like Helen Mirren can make seem less redundant and lame.